You must be following the news on the worsening floods in Jammu and Kashmir. While we are working in some states already struggling with floods, the J & K floods are taking on the magnitude of Kosi and Uttarakhand floods. The upcoming winters are only going to add to this nationwide calamity. Goonj is trying its best to reach out relief in J & K and other states. 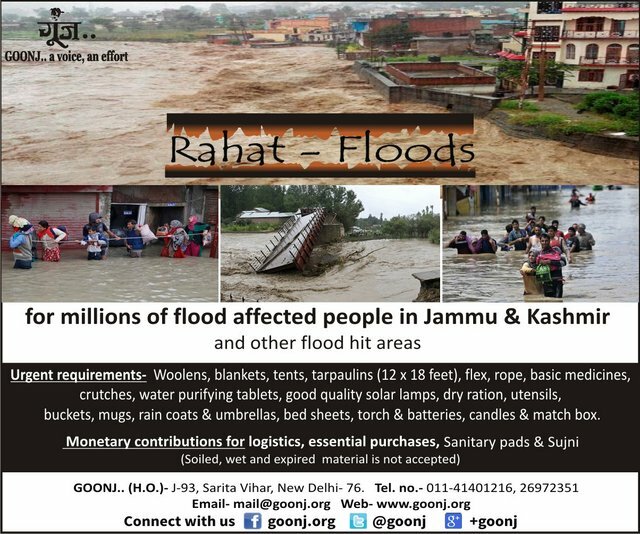 This is an URGENT APPEAL to join GOONJ for ‘RAHAT FLOODS’. We urge you to initiate pan- India campaigns in your offices, schools, colleges and get each one from your network to act..
Humble request- NOT to send perishable items, drinking water bottles, cooked food and dirty/damaged or expired material to any of the center please. Please note- This account will accept the contribution within India only and no foreign transaction is allowed as per guidelines of Ministry of Home & Finance. 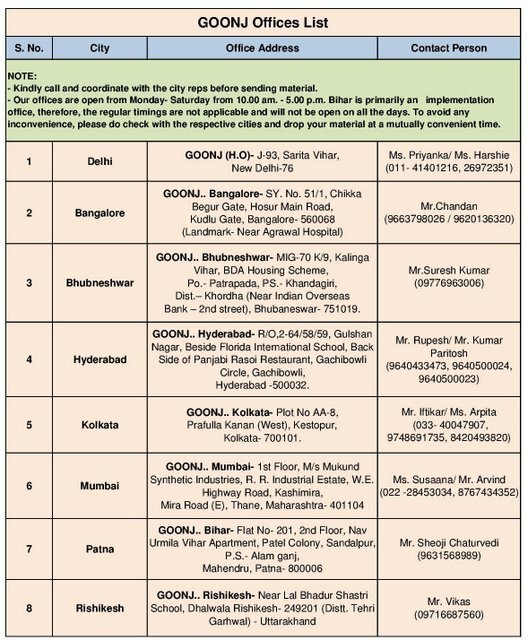 Visit: http://goonj.org/Swift details YES BANK LIMITED.pdf for a list of intermediary banks. 4. Cheque/ Draft: You can make it in the name of “GOONJ” and send it to J-93, Sarita Vihar, New Delhi- 110076 . Do mention your full name, address, tel. no, for receipt purpose on the back of the cheque/ draft. Please note- For receipt purpose, please send your name, amount, email ID, tel no. and address topriyanka@goonj.org , with date & mode of transfer, transfer code/ cheque number, Bank’s name and location with last 4 digits of your account number. c) Logistics support; Material transportation from our offices;Delhi, Mumbai, Bangalore, Hyderabad, Kolkata and the additional collection hubs to the affected areas. Goonj is also keen to create collection hubs in more cities, if anyone is interested in opening up a temporary centre, do write back to us. Do spread the word. Use your face book, twitter, e-mail and websites to spread the message..
We will be updating status on www.goonj.org and on our face book page http://www.facebook.com/goonj.org regularly. Do write to us on mail@goonj.org or call 011- 41401216, 26972351 for any further queries.